Welcome back to Mull or Keep. This is the second in a hopefully long-running series of articles on whether to Mulligan or Keep an opening hand in a specific matchup. 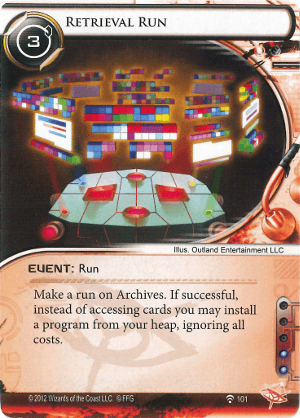 Last time we did Chris Dyer’s Worlds-winning Controlling the Message deck against Ben Ni’s DLR Maxx. This week we examine the reverse match. You are not-quite world champion Chris Dyer. You’re in the finals against Ben Ni, who has just beaten your CtM deck with his DLR Maxx. You’re piloting your Temujin Whizzard list, and he is playing his own SYNC BOOM! Deck. 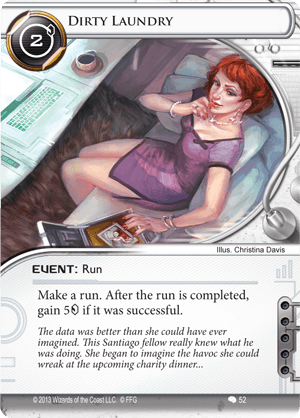 If you win this game, you become the 2016 Netrunner World Champion. The pressure is high and you know it’s not going to be easy. In reality Chris won this game, but it was incredibly close and could’ve easily gone the other way. He played extremely well and very carefully, but in the end it was still all decided on a last ditch Medium run for two cards. It is worth noting that he had run HQ a lot prior to that point, and would have had a strong idea that the agendas were waiting in R&D. In order to understand whether to Mull or to Keep, it is important to know the game plan of both decks. Whizzard’s main goal is to stay untagged, and his primary method of doing this is to both stay richer than the Corp, and destroy any ICE that can force the tag (Data Raven most especially). He also needs to prevent the Corp from getting easy scores, especially Breaking News with its easy tags, or enabling 24/7 News Cycle. While doing this, he should be getting as many clean accesses as possible, helping to turn off the problem of Quantum Predictive Model when he is inevitably forced to go tag-me. These accesses on R&D and HQ are also helpful for the off chance of hitting the BOOM! and trashing it. Eventually it’s likely he will have to go tag-me, but when he does he would like to win the game in a very short number of turns. 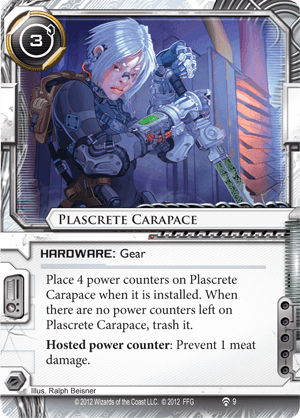 Plascrete helps against the meat damage but does not guarantee safety for going tag-me if the opponent has found their Observe and Destroy. SYNC’s goal is to land some tags and keep them there. If it can land tags then three of its agenda points are unstealable, it can used Closed Accounts + Observe and Destroy to remove a Plascrete, and most importantly can just use BOOM! to win the game. Its main methods of giving tags are 24/7 News Cycle on a Breaking News, or playing Hard-Hitting News. Less likely methods involve naked scoring a Breaking News, or having the Runner encounter tagging ICE and be too poor to remove the subsequent tags. To prevent the Runner from stealing agendas, he either scores them immediately (in the case of Breaking News and 15 Minutes), or hides them behind tagging ICE (in the case of QPM). If this plan comes together, it leaves 3x Global Food Initiative and 1x NAPD Contract as the Runner’s only path to victory. Get Rich Quickly. This is the most important goal for an opening hand. Make Accesses Have Value. This is a mild goal for an opening hand. Assemble Your Rig. This is a mild goal for an opening hand. These cards are rated by their ability to have turn one (T1) impact, so while Liberated Accounts is very good in this match because it gives you run-less money, it is only a “good” card here because it’s less powerful overall and requires additional money to install over your starting 5 credits. 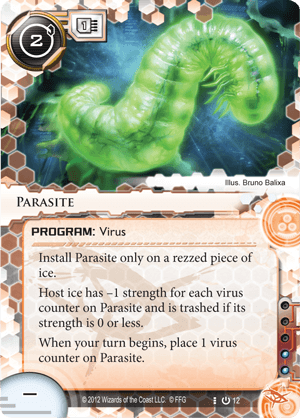 Similarly Parasite is considered only “good” in your opening hand despite being an incredible card in this matchup. This deck does have some cards that are not ideal in this matchup. 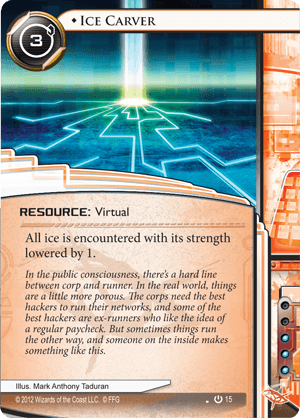 The main examples being Net-Ready Eyes and Ice Carver, which are mostly there to deal with Fairchild 3.0 decks. 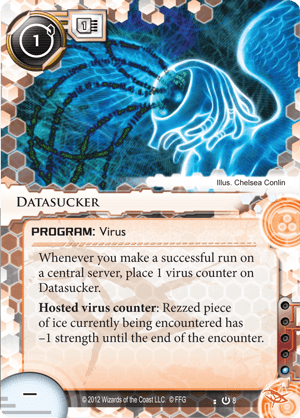 Due to this SYNC not having Cyberdex Virus Suite, it is likely that Datasucker covers the bases of both of these cards, and their install will likely not pay off over time. Employee Strike is a card that has mixed value here, and is unlikely to be worth playing. The ideal scenario for Whizzard is to Parasite any ICE that gives unavoidable tags and otherwise avoid taking tags at all, so Employee Strike is mostly only useful for tags from 24/7 News Cycle, which is a low value play. Its inclusion in the deck is not for the SYNC matchup, and obviously has a lot more value in the CtM matchup, and other rogue decks such as CI7 and Blue Sun. Three money cards and some draw for hopefully more money cards or anything else. Definitely a good start. Ideal Turn 1 Play: Sure Gamble; I’ve Had Worse; Dirty Laundry; Daily Casts. Net gain 3 credits, to 8 credits total and 3 cards, to 4 cards total. 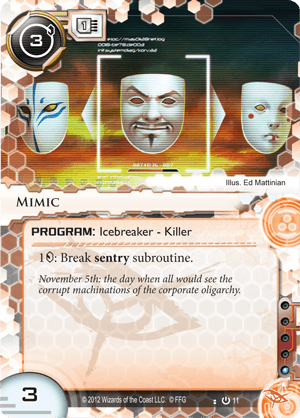 Temujin is your best money card in this game, although it is likely to get shut down quickly. 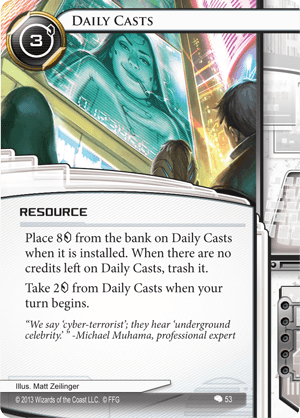 There are also 3 cards that help you draw for more cards here, and a Plascrete which is your ideal first rig piece to survive 24/7 Boom shenanigans. Ideal Turn 1 Play: Temujin an open server; run that server 3 times. Net gain 8 credits, to 13 credits total. Temujin Contract + Dirty Laundry really is the best turn one economy you can hope for, although usually gets worse by turn two. A second Temujin might be a liability if the first gets stuck and you don’t want expensive installs in hand. Inject is obviously a good draw card too. Ideal Turn 1 Play: Temujin a server; Run that server; Dirty Laundry that server; Run that server. Net gain 11 credits, to 16 credits total. Reasonable starting money, but not strong at keeping you going. No draw but Plascrete is still the best piece of your rig to get early to help you survive a 24/7 Boom. Ideal Turn 1 Play: Draw; Sure Gamble; Sure Gamble; Daily Casts. Net gain 5 credits, for 10 credits total, and 1 card, for 3 cards total. The money here is pretty weak. The Street Peddler and Datasucker are both okay and the Paperclip could be trashed for later use, but the real problem is just lack of money. 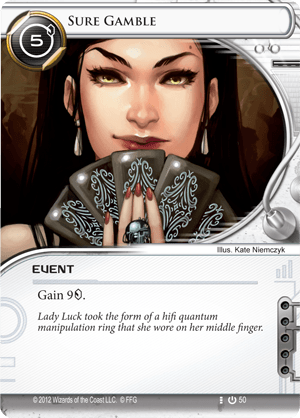 If you mulliganed into this hand you wouldn’t be super unhappy, but it is definitely not worth a keep. Ideal Turn 1 Play (Forced to Keep): (Subject to Draw) Street Peddler; Draw; Datasucker; Dirty Laundry. This hand is incredibly similar to Hand 5, but worse. No Street Peddler, instead we have a super expensive to install Yog. Employee Strike is also worse than Parasite. If Hand 5 was a Mull, then this one has to be too. Fast money turn 1, and some draw + Street Peddler for next turn to get yourself set up. Ideal Turn 1 Play: Temujin a server; Run that server; Dirty Laundry that server; Run that server. Net gain 11 credits, for 16 credits total. This hand has two money cards, but neither are particularly high impact in turn one. The Datasucker is pretty nice as a cheap early rig starter and you can ditch the Paperclip while drawing. 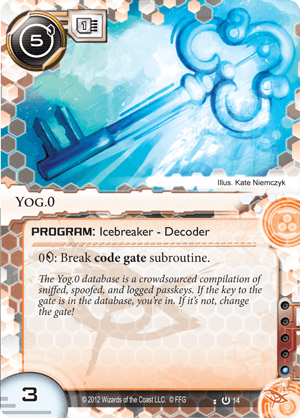 Ice Carver is too expensive to install early and is not as high impact in this matchup as it is against glacier. This hand is similar again to Hand 5, and while it would not be super upsetting to mull into, it is not strong enough to be a keep. Ideal Turn 1 Play (Forced to Keep): (Subject to Draw) Draw; Datasucker; Dirty Laundry; Daily Casts. Another hand where the only economy card is Dirty Laundry. The remaining cards aren’t particularly bad, and there’s an argument that Inject + Retrieval Run are pretty good to have together, however this hand is weak enough that a Mull is a good idea. Ideal Turn 1 Play (Forced to Keep): (Subject to Draw) Inject; Draw; Draw; Dirty Laundry. Temujin + Dirty Laundry is really the ideal economy start. Street peddler is always a good rig starter and Paperclip is nice in that it doesn’t have to clunk up slots in your hand. Six out of ten hands were keeps. It’s also worth noting that a few of the “Mull” hands were still semi playable. It does seem that a Runner’s hand is less prone to a bad start than a Corporation’s. Thanks again to Ben Ni (@beyoken) for his advice with writing this article, @hermit for publishing and @inactivist for his copious editing. miek, mull or keep, Strategy.